What is a skin treatment? What does it do? Should I have a treatment? What treatment do I book for? what can I expect and will I see a difference? Ever been faced with these questions? If you answered YES we have the perfect answer – a custom made Dermlaogica facial! From start to finish a skin treatment is essentially a multi-step process that is one of the best ways to keep your skin healthy and address all your skin care concerns! A professional skin treatment starts with a consultation (in Dermalogica terms – a Skin Mapping Session!) where you can share your concerns with you skin care therapist and discuss what you want out of your treatment. Your Sorbet Skin care therapist will help you understand your skin and help choose the most suitable option for your skin. The consultation makes or breaks the treatment and although it may seem least important, it does determine the results you will see at the end of your treatment. Not only is the consultation important for you to discuss your concerns it allows the skin care therapist to understand your lifestyle, preferences and goals and from the information you share she will plan and perform a treatment to best suit all your needs. What treatment do I book for? There is a landscape of different Dermalogica treatments- all put together thoughtfully to treat specific skin problems or concerns. Your skin is like your finger print, unique to you, and knowing your skin and understanding what you want to treat is the first step to making the best decisions for your skin’s health. Looking through a treatment menu can feel very complicated and may even leave you confused, however there are a few considerations you can take into account before choosing. Treatments are booked out according to time. The time it takes the skin care therapist to perform all the necessary steps and ensure you leave with healthy skin and the results you expected. Dermalogica skin treatments gives you a variety of choice in time and price, however they do not compromise results. The investment you make will depend on the time you choose, the products used and what other steps or equipment are included during the treatment. We often have multiple concerns that are challenging to treat. 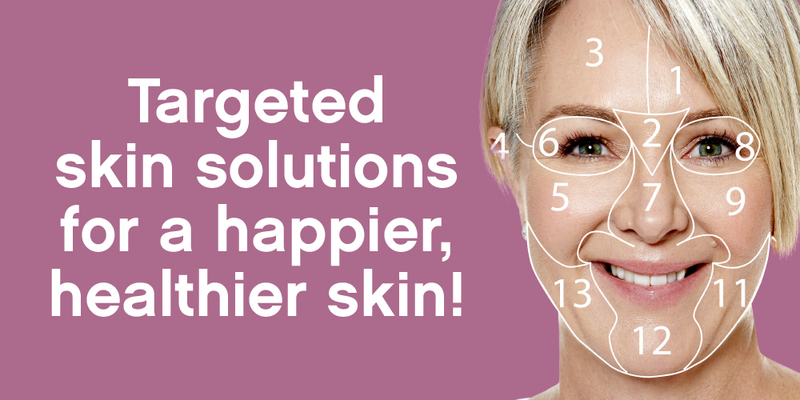 Achieving results and changing your skin needs a more targeted approach. During the 60 minute treatment products are selected according to the specific ingredients and actives that will treat a concern on multiple levels to achieve maximum results within the treatment time. Dull,” “ashy,” and “tired” are three words no one wants used to describe their skin! A brightening treatment involves a combination of hydoxy acid exfoliation, brightening serums and a hydrating masks to remove dead-skin build up and even out the skin tone. The result? Dewy, megawatt glow-y skin! When your main concern is addressing ageing, the best way to get a healthy, youthful glow is to buff away the layers of dead skin that have accumulated from age and sun exposure. Aging is the natural process of life. When we reach 30 we start to lose 1% of collagen per year, and after menopause this rises to 2.5%! Everything slows down, we get sagging and bagging, sensitivity and there is a real battle against dryness. We cannot stop ageing so as skin therapists our goal is to prevent premature ageing (ageing before our time). With regular treatments and good products and ingredients, the results can be dramatic. This treatment attacks signs of ageing on all fronts: cleansing, resurfacing, brightening, and hydrating. When none of the lotions or creams in your bathroom seem to be cutting it anymore, you may need to dial up the intensity of your hydration routine. This treatment focuses on moisturisation. This usually includes smoothing exfoliation followed by layering hydrating serums and masques to amp up the water in your skin. However if you have chronically dry skin the treatment will focus on introducing nourishing essential oils your skin lacks to leave your skin smooth, conditioned and healthy. Breakout prone facials are designed to clear out clogged sebum and eliminate blackheads. Extractions (sometimes with a lancet) do most of the heavy lifting. And although they may leave your skin slightly pink immediately after, they should never hurt. Exfoliation also helps to dissolve the outer layers of skin to resurface it and keep pores clean. We’ve all experienced some form of breakout and sometimes it seems to have appeared overnight. How did this happen?! Your skin therapists will go through a checklist of possible triggers—was it stress, hormones, diet or product? If you have sensitive skin, you might be a little wary of buying products – you never know if your face will turn into an angry, red disaster! If this sounds like you, you’ve probably also steered clear of skin treatments. Unfortunately, the answer isn’t black and white. “Sensitive skin” is a blanket term people use to describe irritated, redness, flaky, tightness, itchy or stinging skin. If this is you, you have sensitive skin. There are many concerns associated with sensitivity such as allergic reactions to products, eczema or even razor bumps. The key is to first repair, soothe and strengthen the skin. Keep it simple. A treatment for any concerns with sensitivity will focus on gentle, soothing, repairing and hydrating ingredients. The treatment includes gentle cleansing, light or no exfoliation and specialised masques to strengthen and repair irritated skin.